We are posting all items from our UK office. 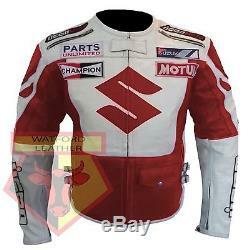 SUZUKI 4269 RED MOTORCYCLE COWHIDE LEATHER MOTORBIKE ARMOURED JACKET. High quality genuine cowhide leather jacket. High quality cowhide 1.3 mm thick leather. Full safety standard for bikers. Removable CE approved armor protections (back, elbow and shoulder). 8 rear zipper for trouser attachment. Velcro straps for side adjustments. Velcro pockets for removable Armor. High quality embroidered logos and badges. Gage 8, Heavy Duty YKK Zips. These are all actual pictures of jackets, which is owned by our parent company ButtCo Group. Measurements of BIKER LEATHER JACKETS in Inches. Suitable for men with Chest Size. Measurements of BIKER LEATHER JACKETS in Centimeters. Actual Measurements of BIKER LEATHER TROUSER in Inches. (Jacket + Trouser + Gloves + Boots). We do not keep huge inventory in stock. Instead of investing on huge inventory, we invest on our customer by providing them best price. We manufacture from fresh leather after receiving order. You might feel smell of fresh leather, which will go away in 2 days time. Packaging is ideal for international orders. Negative or neutral feedback's does not resolve problems. Be sure to add me to your favourites list. Check out my other items. The item "SUZUKI 4269 RED MOTORBIKE MOTORCYCLE BIKER COWHIDE LEATHER ARMOURED JACKET" is in sale since Thursday, April 27, 2017. This item is in the category "Vehicle Parts & Accessories\Clothing, Helmets & Protection\Motorcycle Clothing\Jackets".